Coleman Da Gama 6 Man Family Tent. A versatile family camping tent with generous dimensions including a large living area and comfortable bedrooms. Offering full head-height throughout and a family sized living area that can accommodate a table and chairs for all. A large front rain porch provides shelter from rain on entry and exit and is an ideal space to store muddy shoes. Full head-height throughout tent for maximum comfort. Easy to pitch cabin structure with strong steel poles. Large, front rain porch and spacious living area. Fully integrated sewn-in groundsheet ensures weatherproof and bug-free camping. Flysheet: Polyester, 3000mm PU coated, taped seams. Inner: Breathable polyester and no-see-um mesh. Set up Pitch in one. Groundsheet PE, welded, fully integrated. Outer fabric Polyester PU coated/Fire retardant. Pack size 76 x 36 cm. 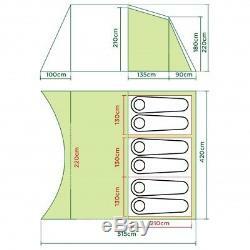 A large range of Coleman tents are available in our shop. We have all you need to kit out your motor home/campervan from the basics of foam insulation and carpet lining your vehicle, we also hold lightweight ply in assorted shades, and can custom make tables/worktops etc. We stock Seitz windows in all manufactured sizes, sliding and hinged option, an excellent selection of rooflights/vents and for ultimate luxury, air conditioning units. Naturally we hold a full range for all services, gas, water and electrical components, from gas/water heaters - the Propex and Truma collections - the complete CBE electrical charge and distribution system with all accompanying switches/sockets/matching frames and should you wish an alternative, the Zig range of electrical appliances. We also carry allied gas/electrical and water fittings. With regards to the kitchen, we offer a great selection of equipment - fridges, hobs, grills, cookers and sinks from leading manufacturers Smev , Cramer , Thetford / Spinflo , Dometic and Waeco. For the bathroom we have cabinets, basins and shower trays, swivel/bench toilets and Thetford cassettes, assorted porta potties and obviously we have water tanks/pumps, and fresh/waste water carriers. We hold Comet & Reich taps and brand names such as Fiamma , Aquaflow and Whale. Now to the exterior of your vehicle - why not finish it off with a superb Fiamma Awning, in a variety of colours and sizes to suit your requirements and what about a cycle rack, to carry those all important bikes? As well as catering for the motor vehicle side, we also have a full range of leisure products for camping -watersports - even for the Skiers amongst you! Carrying ranges from brand leaders Trespass , Coleman , Sevylor , Gelert and Royal. If you would like to have a chat about any of the above items or have any general enquiries please send us a message on. We will be only too pleased to help! Any items being sent via courier to Northern Ireland, Isle Of Man and any other Uk offshore addresses are subject to an additional charge. The item "COLEMAN DA GAMA 6 MAN TENT person camping family large spacious 3 bedrooms" is in sale since Tuesday, October 24, 2017. This item is in the category "Sporting Goods\Camping & Hiking\Tents & Canopies\Tents". The seller is "grasshopperleisure" and is located in wisbech, Cambridgeshire. This item can be shipped to United Kingdom.